Kinetic Sand can be found at your local hobby shop, Michael's or, Hobby Lobby. Please shop local whenever possible! 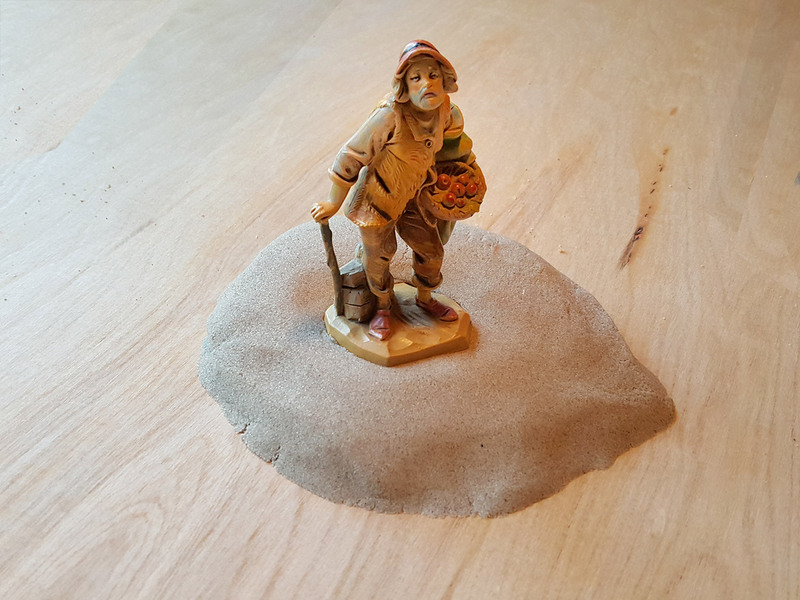 With our previous project using the floral foam, we've used the same person to work with the Kinetic sand. The Kinetic sand was so easy to work with! 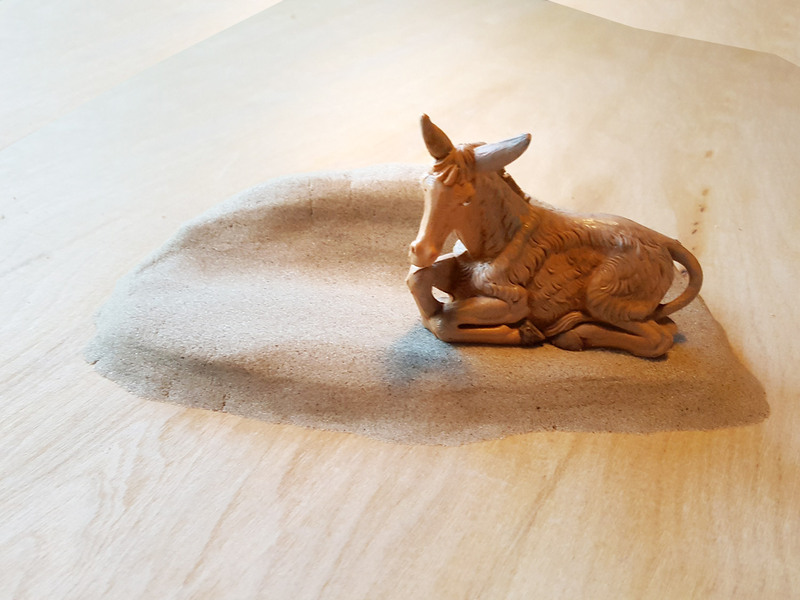 It forms so well, and you can easy shape it since it's sand. The sand isn't wet, but it acts like how wet sand would kind of act since it's so easy to shape the sand just the way you want it to look. As she took the sand out of the package, it took her just a minute to for this mound. Smoothing out the sand is super easy. You can just do it with your fingers! 30 seconds later she had put a lip on the back of this mound making it more like a pedestal than just a mound. 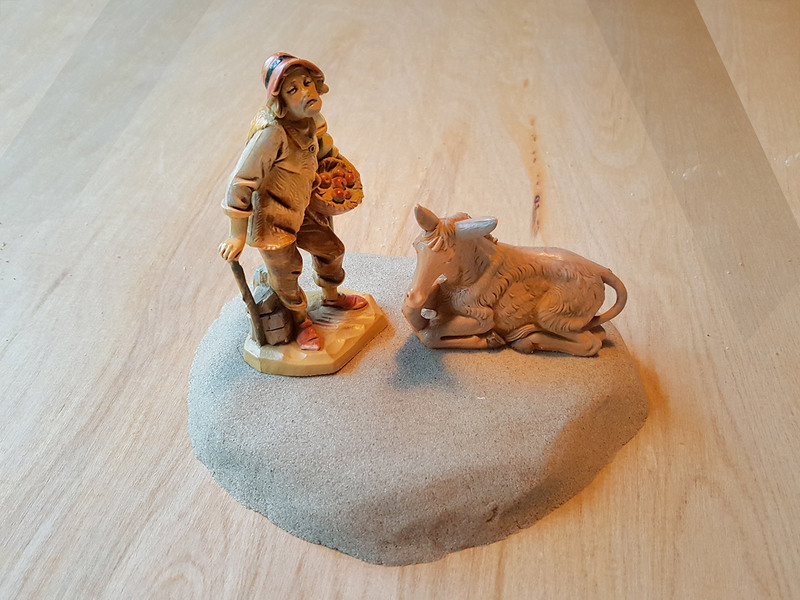 This will hopefully give you an idea as to how this special sand looks as soon as you take the figure off of the sand itself. It's just as you would see if you were on the beach, but this sand isn't anything like beach sand. In less than a minute she re-worked the sand to make the mound wider and smoothed it out a bit.. In another minute she made this sand mound taller and narrower for this king. She said this sand was crazy in a good way as to how it reacted when she was working with it. 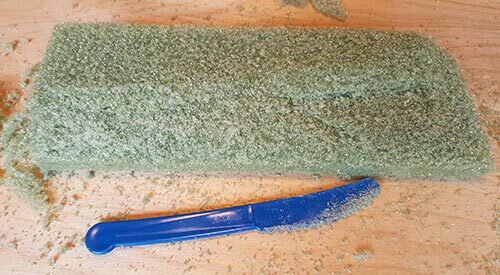 The Kinetic sand is suppose to never dry out, and it can be used over and over again! 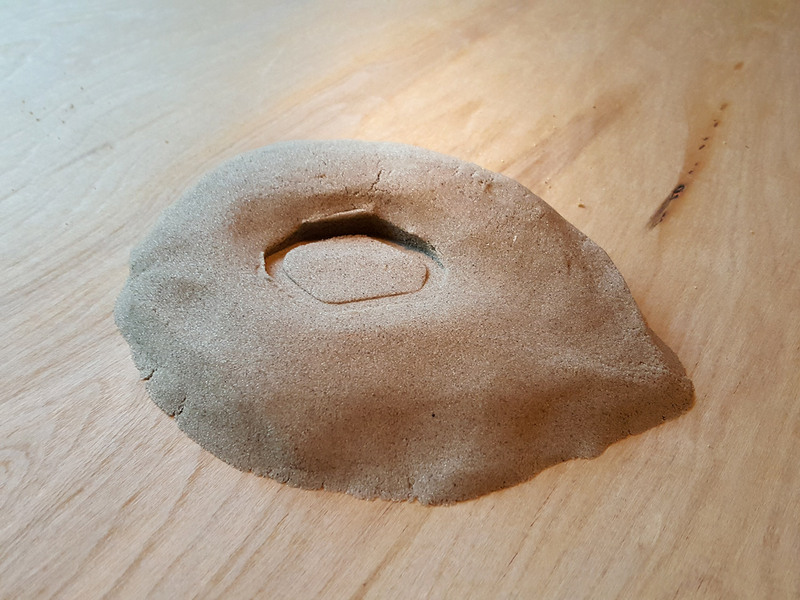 She said the said had little specs that dropped off while she was working with it, but you can take the mound of sand and press it against the specs of broken off sand just as you would using dough when making bread. She said she gives this Kinetic sand 2 thumbs up, and would've given it 3 thumbs up if she had 3 thumbs herself! If you have any idea's yourself as to what you think we should test and post on the website, please let us know! Here's a video from the manufacturer of Kinetic Sand that may give you a better idea as to how it looks, acts, and how you can easily form it! We had a brave soul from our office try and create a piece of landscape by using the materials shown in the photo to your right. This person had no ability in crafts at all. That's why we selected her! 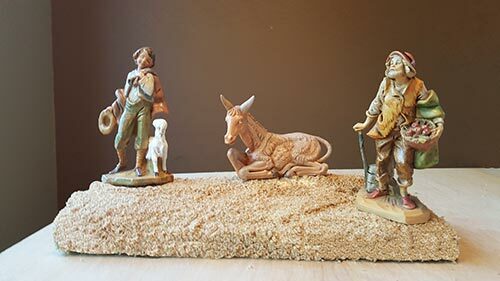 Without any guidance, her goal was to create more height to her sand landscape material she uses for her nativity scene. She wanted to create a tier to place shepherds, sheep or, palm tress upon. 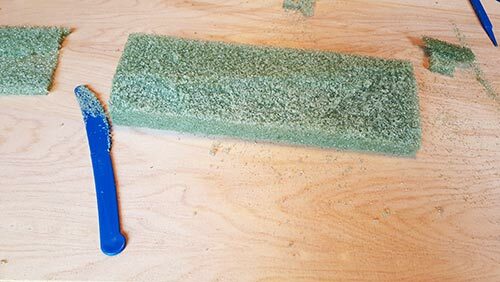 By using a very inexpensive knife and tool set, her idea was to take a block of the floral foam and cut it to her desired height. 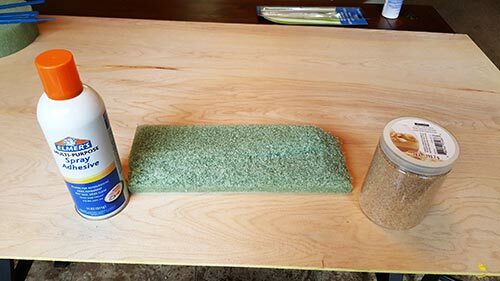 The cut didn't need to be perfect because a coarse sand would be used with spray adhesive to cover any odd in-perfections. 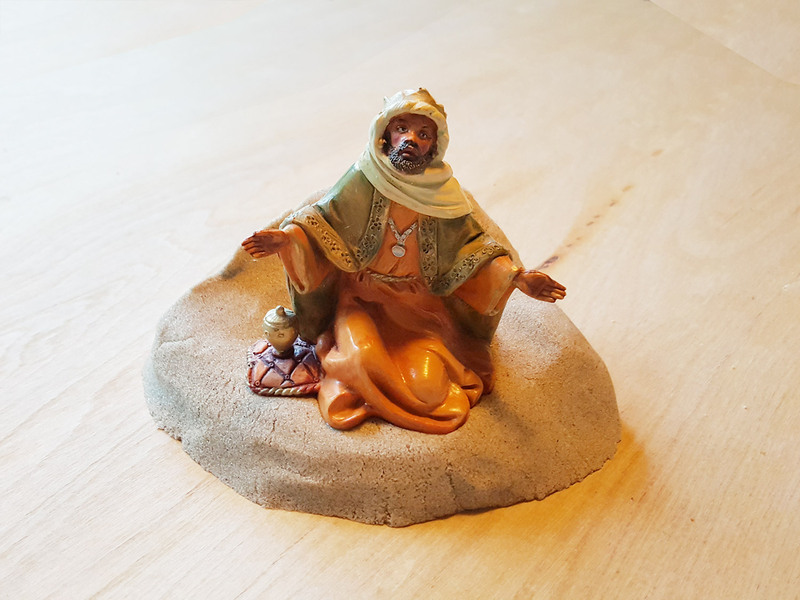 While using the knife, the goal was to taper down one side to allow for a smoother transition from the main level of the nativity scene. As you can see, she really went at it! After a little clean up, it was time to start to spray the floral foam with spray adhesive. Please note: Please read all directions with any product you use. This was done in a well ventilated area, but what we were told is that outside would be best if at all possible. She also mentioned that outside would be best for both health reasons, and because of the over-spray the adhesive created. 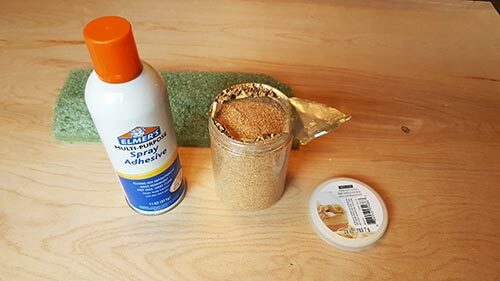 Now it was time to open the jar, and get ready to spray and sprinkle the coarse sand over the top of the floral foam. 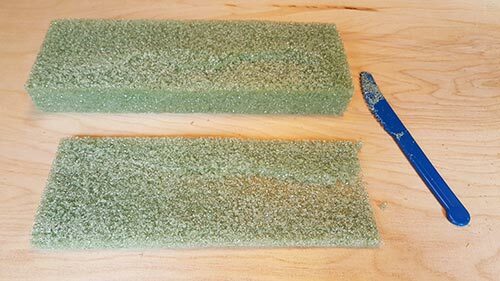 After putting a layer of adhesive spray of the floral foam, with a thin layer she sprinkled some coarse sand over the foam. She then sprayed down upon the sand, and sprinkled a second layer of sand onto the foam. After she gave it time to dry a bit, she sprayed down onto the sand once again as she attempted to permanently adhere the sand onto the floral foam. The only thing she wants to do before she uses it in her display is to use a coarse sanding block and smooth out some area's in which she wants to place figures, and to give it a more finished look. 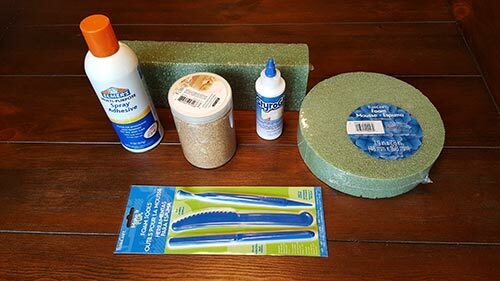 • Flora-Craft Foam If you have any suggestions or, if you want to share your own scene building tips and tricks, please click here to Email us! To see additional creative ideas, we suggest you click here to check out the photo contest page!